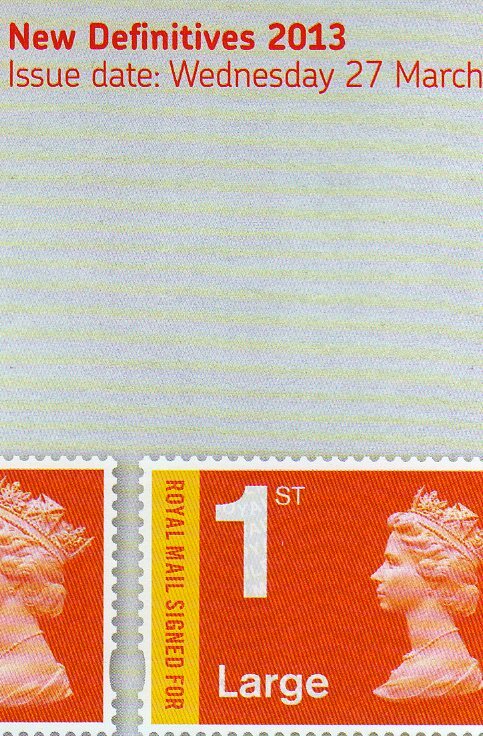 Surprise omission from Royal Mail Signed For Stamps! The new tariff and Royal Mail Signed For stamps have arrived in Post Office branches on the day of issue, enabling collectors and dealers to get their first day covers with CDS postmarks. But for those collecting date blocks, or simply recording printing dates there is a surprise, as these details are missing from both values that we have seen. These strips are from the lower pane of the guttered sheet of 50. The sheet number and printing date would normally be in this margin. Perhaps some exist with the date? I'm sure somebody out there will tell us - and send pictures. Thanks! 1. All reports so far indicate that the date & sheet number are absent on all stocks. 2. My postmaster told me today that Branches were told yesterday afternoon to stop selling these Royal Mail Signed For stamps and that they should not be sold until Tuesday 2 April. Tallents House subscribers will have received their 'first' announcement of these stamps: I've sent this image to Post Office and Royal Mail Stamps by twitter. This explains one of our correspondent's experience at York where he was told that they would not be on sale until Tuesday (and they didn't have any anyway). Distribution seems to have been sporadic with rural sub-post offices receiving them but Norwich's main crown office (said they) had not. Post-Easter update: As Brian reports in Comments, below, the instruction to postmaster was to hold back the Stationery associated with the new branding ie Royal Mail Signed For, not the stamps. My postmaster sheepishly admitted this today - and also said that they hadn't had any of the new stationery anyway! Is the printing date and sheet serial numbers on the upper part of the sheet for a change? No, it's not on the sheet at all. I saw the whole sheets and the blank lower right stood out like a sore thumb. Top right had barcode and short description as usual. Could this be an error as I thought the SSN was a requirement for accounting purposes? I know the odd sheet can get through as I have seen one before some years ago. Were all the sheets like this? Ive had word from another office that the stock was the same, no number or date. I have had another report on the Royal Mail SIgned For and can also confirm no printing date or SSN. Both types, large and small are from cylinders D1 D1 / D1 and both have MA13 within the security overprint. I found the three new values locally but not the recorded delivery stamps. Did you see the cylinder number? Do you know who printed the recorded delivery stamps? How many spot positions? Printed by De La Rue as mentioned elsewhere. I didn't have time to look at the rest of the detail as the PO was busy. I'll try tomorrow if I can get there at the right time! De La Rue printed both large and small Royal Mail 'Signed For' stamps from cylinders D1 D1 / D1. Both have year code MA13 and both are in double panes of 50 stamps each from four positions. So exactly the same as the previous MA10 versions. The branch in my local ASDA told me today (Saturday) that not only were these not on sale until 2 April, but they were not allowed to sell these over the counter, but could sell them only if they stick the stamps on the envelope! As Victor Meldrew would say - I don't believe it! 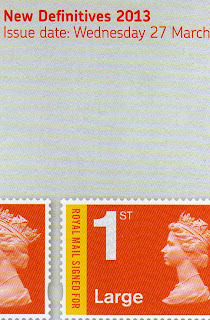 I can understand instructions from Post Office Limited telling Post Offices not to sell before the 2nd April as each stamp will cost 15p more for Royal Mail by then but why are they not allowed to sell stamps over the counter and let the customer decide what they want to do with them. That’s one of the joys of having offices franchised out to retail partners, poor training, poor knowledge of services, especially when it comes to special delivery & recorded, refusing to accept the 1st & 2nd class stamps as part payment on mail to Europe & beyond (or has that changed again), the lack of availability of stamps other than Machins, with the odd Scottish or welsh country stamps now and again. It will be interesting to see where the 2 P&G machine from the Broadgate Crown Office go when it closes in May. Will there be another Post & go only office? Do any Post offices, other than the “pliatelic” sell the £1.50, £2, £3 & £5 stamps any more? I’ve tried to buy the new signed for stamps from my local office (TW), but was told that they are no longer allowed to sell the over the counter, they can only be affixed to the letter, and this now also applies to the registered stamps as well. I tried another Post office, in a different postal area (SW), told the same thing. I had sight of the instruction in the first post office, which states what they are doing is correct. So it is a case of rogue districts or confusion from on high? Neither office had the new country stamp(s) or the machins. I'm surprised that they hadn't got the Machins available for sale as they were distributed a while ago and were readily available in many post offices last Wednesday on the day of issue. I'll check on this new instruction with my contacts and report back here! We have made the sale of RMSF stamps very straightforward: nothing has changed as part of this Tariff change. We have re-communicated the instructions on how to sell them easily. If you can get a copy of that instruction that you saw, or copy the wording, that would be very useful. Meanwhile I'll make enquiries locally. Post Offices were instructed not to use the newly branded 'Signed for' barcoded labels before 2nd April- Instructions were given to sell all of the Tariff staps on the 27th March. If branches are saying anything different then they havent read the isntructions properly. Last week up to Saturday when the 'Signed For' stamps were £1.55 and £1.85 none of the offices that I went in to had any stock. That's fair enough as there had been some problems with these. 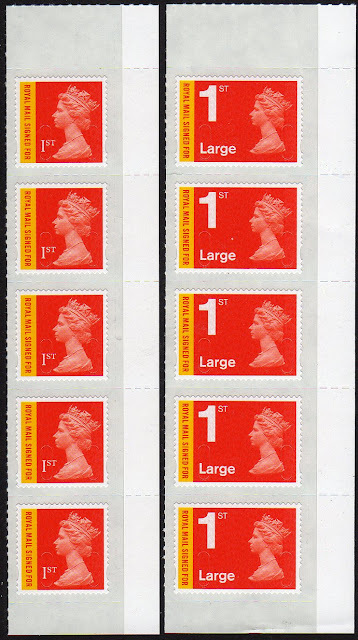 I also went in to one small sub office on Saturday morning and was told they had not received any of these stamp although they did have the 78p, 88p and £1.88. This office closed at 12.30pm on Saturday and did not open again until Tuesday morning at 9.00am. I went to this office on Tuesday morning at 9.00 o'clock and guess what they had several sheets of the new Signed For stamps when the new prices were now £1.70 and £2.00. In fact all the offices that I went to on Tuesday and today have the 'Signed For' stamps. At the new price! It's unfortunate, but I suppose we are lucky that they normally sell stamps before the date of the tariff change. 30p is a lot extra to pay, though. I'm glad I ordered from Tallents House in advance - just wish I had the stock here by now! I too ordered stock from Edinburgh before the date of issue so Signed For at old price. However, I went into my local PO this morning to find that they had the new tariff presentation packs but instead of the price on the day of issue (£7.45) they were at the new price of £7.75. I was told that this was the price on the till and that was that. I did point out the issue date on the back of the pack which was the 27th March but it made no difference. The price on and after 2 April, both at Post Offices and from Edinburgh must reflect the 15p per stamp increase in the Signed For premium. Brian, if you look closely at your presentation pack you will see that the 'value' stamps are not the same as the counter sheet versions (aside from being guillotined).